Gold Panning – Is It Still A Way to Get Rich? Gold panning is a manual labor intensive method of searching for gold that had been historically utilized before major gold mining equipment was invented. With gold panning, the only piece of gold mining equipment you will need is a wide shallow pan. However, once you do find gold deposits, you might require some additional gear like brushes, funnels, magnets and tweezers to extract them from sand debris. Most gold panning is done in shallow rivers or streams by placing riverbed material like gravel, rocks and sand into the pan and shaking it under the water to allow naturally heavier gold deposits to settle at the bottom of the pan. Seasoned gold miners developed their own set of pan motions they swear by that they consider especially effective. It definitely takes a few tries before you know what you are doing. According to multiple old day gold mining stories, California gold-rich river streams enabled some miners to extract almost 96 ounces of pure gold just form one pan back in the 1800’s. In the modern days, gold panning is not considered to be a very efficient method of gold prospecting due to high labor expenses and inability to access deeper riverbed materials. 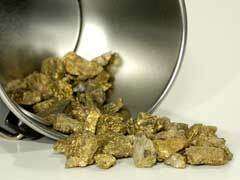 Gold panning might be used while initially trying to pinpoint the exact gold-rich sources or areas. Once such areas are identified, more heavy duty commercial gold prospecting equipment is used. It’s very unlikely for someone to get rich while using this rudimentary gold prospecting method; however, you can definitely try it if you feel lucky. You can still hear stories from successful gold panning miners from time to time. Gold panning remains one of the most exciting tourist attractions you can enjoy in some of the former goldfields in Alaska, California or Nevada. If you would like to learn about another popular gold prospecting method like gold sluice box, scroll over to read our article on this subject. Our article on current gold mines for sale will describe some great opportunities for an emerging gold prospector.